Here are some photos of the teeny-tiny (784 square foot) converted carriage house I lived in before I bought my current home. This was my first place on my own (not counting the dorms in college). I have lots of fond memories of this place. It's amazing to look back and see how much my taste has changed over the past few years! If you look carefully, you will see some of the items repeated in photos, because I am constantly re-arranging! In a future post, I'll explain my re-arranging technique that keeps everything fresh! Above are some lotions and potions in the bathroom. The Apothecary bottles are antique, I got the mercury glass jar on clearance at Pier One for $5.00! I love this little alabaster compote! It is Victorian and once had little birds attached to it, but they were long gone before I acquired it! It now has a birds nest in it and lives in my bedroom for now. Look at the super cute French plaque, in case you forget where your are! Reflections! I wish I still had some of the bath salt in that bottle! It smelled so good! My inspiration for this vignette was a Paris Flea Market--so be it, I've never left the USA, but this is how I imagine one may look! Crusty, rusty, fleur-de-lis--I picked this up in Williamsburg, VA! I'm not sure what it went to, but it screamed "take me home"! Another Gothic Vignette! See the candelabra--I have a pair--they are about 4' tall with the candles in them! They are made of silver-washed brass and weight a ton! Again, Pairs was the inspiration for this vignette! This leans a little towards the creepy side of Gothic, but it is all so romantic! I got the antique lion from an estate sale of a Lutheran minister--his home was beautiful! Check out that green on the wall! This was a rental, and I didn't pick the color, but it certainly was fun to decorate around! It amazes me how wall color can change an entire look! I'm not sure why the paint ends like that....but the place had bead board ceilings! I miss that! Antique buttons! Yay! I just love buttons! Well, I hope you've enjoyed! This post has really brought back some fond memories of the carriage house. This was the out building of an 1879 mansion. The grounds were beautifully landscaped with something blooming nearly year-round! It's a shame I don't have any photos! Hopefully I can sneak over there and take some this spring! 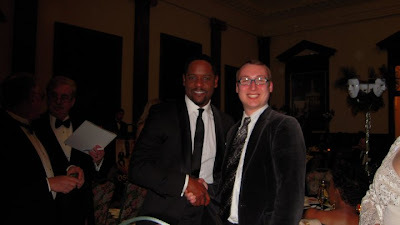 Regarding the home and grounds, parts of Asunder, starring Blair Underwood were filmed here! I've met him several different times, as he lives part of the year near by, and his parents live a few doors down from a very good friend. Oh--here is a photo of me with him at the Oscar Night America from a while back! Did you notice--we both have Dilbert Ties! Ha! As always, comments are much appreciated!